If you live in a warmer climate, there is a lawn alternative that many people enjoy. 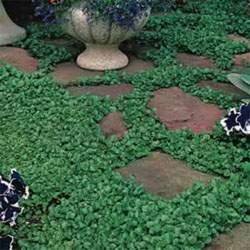 Dichondra repens is a perennial ground cover that only reaches about 2 inches in height. It prefers full sun, and it can handle light foot traffic. Dichondra has a creeping growth habit and stays low to the ground. The leaves are circular and bright green. Dichondra ground cover seed can be started directly outside. Wait until temperatures are in the 70Fs during the day and 50Fs at night. Prepare a seedbed that is weed free and loosen the top several inches of soil. Press the seed into the soil but do not cover it. Keep the seed consistently moist until germination occurs which is usually within 14 days. After the seed has germinated, water it deeply but infrequently to encourage deep roots. Water the ground cover about 1 inch each week. Dichondra can be mowed or used in landscape areas with no maintenance. Dichondra repens is one of the easiest ground cover plants to establish from seed. It is grown as a perennial in USDA Zones 7 - 11. It only reaches 2 - 3 inches in maximum height and never needs mowed making it a perfect lawn alternative. Dichondra is actually called a grass many times since it is used for lawns. It is sometimes referred to as pony foot or kidney weed. It has a prostrate or creeping growth habit making it an ideal ground cover plant. Plant 1 pound of seed per 500 square feet. These seeds are heirloom and non gmo. If you have any questions about this product by Outsidepride, contact us by completing and submitting the form below. If you are looking for a specif part number, please include it with your message.